Albion Cooling Systems Ltd can supply any major type of water of water cooling equipment, suitable for industrial and commercial processes or of air-conditioning applications. We offer ranges of evaporative cooling equipment which include open circuit cooling towers of induced draught or forced draught configurations, counterflow and crossflow, closed circuit cooling towers and evaporative condensers. Open circuit packaged cooling tower ranges are available for the smallest applications (less than 1.0l/s water flow) to the largest practical (approximately 260 l/s). Multiple cell units can be also be supplied. Most ranges are available in galvanised or stainless steel. Counterflow cooling towers can be supplied in either forced or induced draught configurations to cool nominal water flow rates from approximately 3 l/s upwards. Closed circuit cooling towers and evaporative condensers for refrigeration applications are also available in forced or induced draught designs. 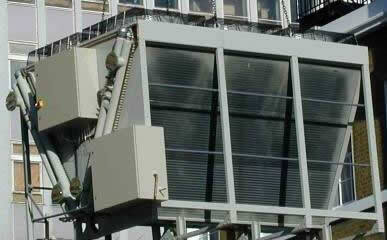 All types are available constructed from galvanised or stainless steel. Many can also be provided constructed from GRP plastic. 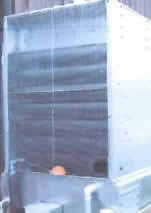 As an alternative to ‘wet’ evaporative systems dry air cooler (also known as air blast radiators) systems can be provided. These are air-cooled sealed systems which avoid the need for water treatment and compliance with guidelines such as HS(G)70, L8 and TM13. Where lower water temperatures are required, similar to cooling tower temperatures are required, we can supply adiabatic dry coolers to meet this requirement. 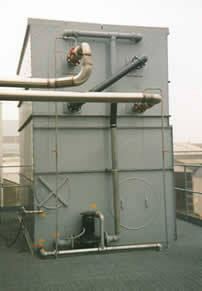 Adiabatic units are also ideal for air-cooled projects with space or noise restrictions.